Suet is an excellent source of energy for birds. 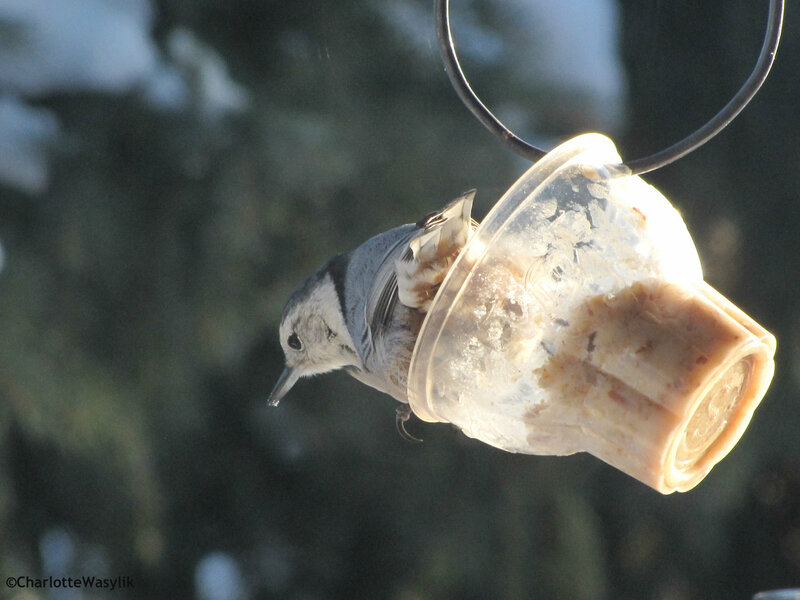 You can provide plain suet, or mix it with nuts, raisins, and other fruit. You can buy the mixture, or make your own. One of the benefits of making your own suet cake is saving money as well as knowing what’s in it. Suet can be provided in a variety of feeders: smeared on a branch or log or even on a pine cone, in a suet cage, in a tray, or in a mesh bag (like in the kind onions come in). 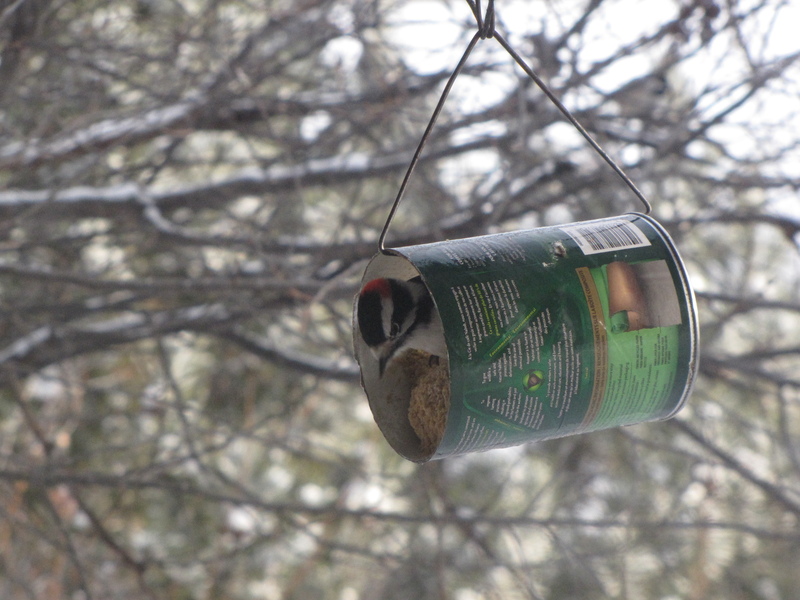 Here is my grandmother’s recipe which is a hit with Chickadees, Woodpeckers, Nuthatches, and even Redpolls, as you can see from the photos below. My grandmother reminded me that birds enjoy this in the summer, and one of the benefits of this recipe, since it’s not straight suet, is that it’s not very drippy when the temperature gets warmer. Melt the lard/fat with the peanut butter, then add cornmeal, flour, and any dried fruit and/or nuts to the mixture and stir well. Let it cool and harden in any container, and then it’s ready to put on a tray feeder, in a suet cage, or in a tin can. If you make the whole recipe and have too much, it freezes very well. If you have a favorite recipe, please share it in the comments! 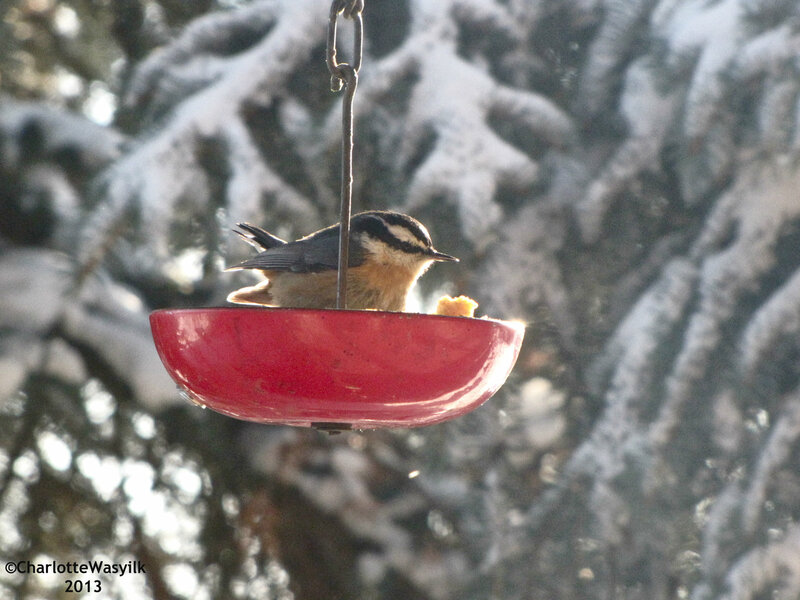 This entry was posted in Alberta Birds, Birding, Birding Items, Blogging, Canada Birds, Feeding Birds, General Birding, Nature, Winter and tagged Bird Feeders, Downy Woodpecker, Feeding Birds, Red-breasted Nuthatch, Suet, Suet for Birds, White-breasted Nuthatch. Bookmark the permalink. I’m so glad I was able to help you, Barbara! Please let me know how the suet turns out. Thanks, Charlotte. Now I know what to give my husband for Christmas! I love the idea of using interesting containers to jazz it up. I’m glad you found something for your husband, Laura! Me too! He’s impossible. At least the birds and I will have fun. Thanks for sharing your recipe The Cats and The Birds! I should try it sometime! Sounds like it makes a lot! How long will that much it last for about? It depends on how many birds visit your feeders. The birds at my grandmothers feeders go through it in about three days! Charlotte, nice photos. I may try that recipe!